uBinary have not sought to register with the FCA to provide Binary options trading to UK residents. They are therefore not legally allowed to accept UK traders. uBinary are a growing brand among binary options trading brokers, and CySec regulated. They offer a range of account types which ensures traders can enjoy investing at the right level for them personally. Initially founded by finance industry professionals, with over 50 years of service in the sector, uBinary continue to grow. Principle 1. By simplifying the trading process, making it easy, safe and fun to trade binary options. Principle 2. By enabling traders, through 24 hour customer support, to share their trading wisdom. Principle 3. By offering a streamlined, user-friendly trading platform. Signals service – Yes, Absolutely Free. Bonus details – 10 Risk free trades. Mobile App – Yes. iOS only at present (Android version being developed). The uBinary website is fast and exciting, and the trading area reflects this. The design is fairly unique among other brokers. The traditional ‘trading’ area, with call and put buttons is not immediately visible. At uBinary, the trading area displays a huge array of data, and specific tools only become available once an asset or option has been selected. Another change unique to uBinary are the sidebar options. These are ‘social trading‘ and ‘market news‘ areas that can be hidden or displayed as required. The social trading menu scrolls through the latest trades and performance of other traders, giving users the ability to follow that trader and monitor their trade. The market news area is, as the name suggests, for keeping up to date with market updates from around the world. The central part of the trading area is dedicated to trading. Menus along the top allow specific option types and then assets to be selected. Beneath that is a list of most popular assets being traded at that moment. It is possible to trade very quickly from the list. ‘Up‘ or ‘Down‘ trade buttons are available, next to an amount field. Likewise the strike price and expiry are displayed in the row. Once a trader fills in the amount field, they can hit ‘submit‘ to make the trade there and then. This cut down version of the trading window will be a real benefit to traders looking to spend the minimum amount of time actually trading – there are no distractions and no complication – freeing up traders to spend time researching, rather than carrying out, trades. If however, users prefer to see the latest price graphs, and ‘traders choice’ barometer, simply clicking the ‘+’ on the right of the asset will open up a more familiar trading screen (more akin to that offered by rivals) with configurable price graphs and a more traditional layout. As well as enabling the trader to select the level of detail displayed, uBinary have gone further and offer a range of layouts as well. So traders who do not like using the ‘list’ view, can select four traditional windows at once, or just one enlarged trading window if preferred. It is probably the most configurable trading area available in the binary options sector. uBinary offer options in currencies, indices, commodities and stocks. Their asset lists are good, but currencies are the clear strength. Other asset classes are likely to be expanded as the brand grows. The option types available are all generally variations on the above/below options, with expiry the only real variance. The key strength though is the option builder, which does open up a lost of avenues for traders, particularly those looking to hedge or manage risk even more effectively. Above / Below – The traditional binary option, will the asset value rise or fall? 60 Seconds – Very short term trading is available at uBinary, with expiries of just 60 seconds. Speed Trading – Again, short term above / below options. This time with expiry times of 2 or 5 minutes. Option Builder – The ultimate in trader flexibility. Option builder allows traders to select the asset, payout and expiry period they are looking for. It will also allow for a small return if an option finishes out of the money. Long term – More and more traders are now using long term binary options as a conventional investment or hedging tool and uBinary have a good range of long term options. The mobile app at uBinary is currently only available on apple devices, with android being developed and released soon. 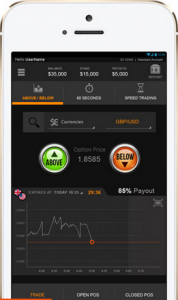 The iOS app does offer a comprehensive trading service. All option types are available as are all assets. The trading display differs from the website, as it defaults to the more traditional trading view, with a price graph the prominent feature and large ‘Above‘ and ‘below‘ buttons either side of the current strike price. All the relevant information is available, making trading from a mobile device very simple. The layout also suits touch screen phones whilst reducing the capacity for human error. Below the trading buttons are an open position window and closed position (trade history) window. These detail all current and past trades, so an up to date view can be viewed anytime. With the android version being developed, it is likely that further changes will be made to add some features to the mobile app across platforms. While the current offering is functional, it is also unspectacular, but does the job. The trading payouts at uBinary generally hover around 77%, they can reach 95% on certain assets. The Option builder feature can offer 80% on some of the leading asset types, and includes the flexibility of being able to reduce that payout in order to ensure some funds are returned in the event of an option finishing out of the money. Valid photo ID such as a Passport. Utility Bill which is dated under 3 months with current name and address. Both sides of the credit/debit card to be used to make the initial deposit. Everything must be covered except: the last 4 digits, the name, expiration and the CVV security digits on the reverse. These measures should, in theory, protect the trader as well as the broker. In order to avoid delays, it is worth setting this information up prior to needing a withdrawal. As is normally the case (to avoid laundering) sums up to the amount deposited must be first returned to the same source before another withdrawal method can be used. Bank accounts used for withdrawals must match the name on the trading account, the minimum amount that can be requested is £50. uBinary suggest withdrawals to debit or credit cards will take between 3 and 7 days, and up to 10 days to a bank account. This is longer than rival firms and something uBinary should look to improve – on the plus side, withdrawals are free, which is not always the case elsewhere. Deposits can be made via credit cards, bank wire transfer of ewallets Neteller and CashU. The minimum deposit initially is £250. There is not charge made for deposits and the funds are available to trade immediately. It is possible to open an account without making a deposit, but it will not be possible to trade. Buy Me Time – An innovative trading tool that allows traders to extend expiry times in salvage options and increase overall strike rates, and profits. This is a unique feature for uBinary. Option Builder – This gives the trader the option to build their own trade, selecting the asset, payout and expiry time. Particularly useful for traders who have a specific niche and know how to maximise their knowledge. Buy Me Out – uBinary provide the option to close deals out early, either to lock in profit or reduce losses. Advanced charts – Charts with a wide range of timescales and indicators give trader greater powers to research. Levels of Accounts – From Micro up to Platinum, traders can open an account type that suits them and their investing needs. The education material at uBinary is in depth, and the documentation that compliments their trading area is excellent. The majority of the features at uBinary have been designed to offer traders greater flexibility, so they represent the broker of choice for any traders who may feel a little restricted with their current broker or platform.